Winner of a DC Snowboard. 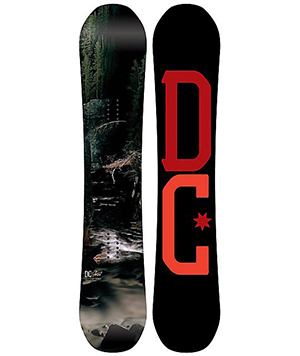 Enjoy riding this season on a beautiful work of art, DC has collaborated with Vincent Skoglund to create this awesome ride. Find more on Vincent and his work with DC here. Congratulations Brandon Mcgowan, winner of the 686 ​outerwear kit from our Labor Day season pass sale raffle. Keep warm and dry in any environment with the help of their High Tech & Good Times. Be sure to check out the teaser for their up coming video "686 Seconds" premiering at the Attic in downtown Hollywood September 17th. Doors open at 7pm. Please come celebrate people who love to go snowboarding! Congratulations! Enjoy taking your music with everywhere with this Skullcandy Bluetooth Speaker. This tough wireless speaker can withstand everything from downpours at the beach to party fouls. Pair up to two separate Bluetooth enabled devices to keep things rocking. Enjoy parking like a boss all season long with your new VIP parking spot! 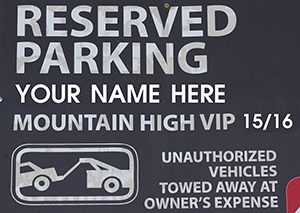 You'll never have to worry about parking again with this reserved space at our West Resort. So when the powder starts to fly, you can take an extra second to stop and grab your cup of coffee and Krispy Kreme doughnut knowing that your parking spot is reserved. Congratulations Harrison! 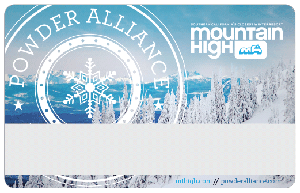 You're the winner of a 16/17 Mountain High Powder Alliance Pass. Enjoy exploring all 13 premiere North American resorts in the Powder Alliance this season, plus Brian Head, UT. This pass includes discounts to Wrightwood activities, discounts for family and friends, and much more.